Are you looking for an online casino that offers a wide selection of games, top-notch security, numerous promotions, a variety of payment options and a friendly customer support team? If yes, look no further for Energy Casino is the place to be. Thanks to Probes Limited Investments, Energy Casino found its way into the online casino industry and ever since 2013; It has taken great strides to deliver quality services to its players.  If you are not yet convinced whether to register or not, go through this detailed and unbiased review to acquire reasons why it is the best place to be. Two renowned gambling commissions including the Malta Gaming Authority and the UK Gambling Commission License Energy Casino. Owning these two licenses is not a mere achievement because you have to follow the stringent rules and regulations established by the two gambling commissions, a task many gambling houses have failed to accomplish. It has been operating since 2013, and during that time, it has exhibited utmost discipline that enables it to keep its customers safe and secure at the site. As if that is not enough, Energy Casino uses the latest encryption technology to protect all the personal details you provide at the site. Therefore, if you are asked to provide personal details like a copy of your Driving License, a copy of your utility bill and your credit card number, do not hesitate for the information will be safe from any miscellaneous activities. Energy Casino takes it a notch higher by putting measures in place that exclude minors. This is in a bid to prevent underage gambling, an act that is illegal in this industry. Moreover, the casino provides a fair gaming environment to ensure players get the most from playing the games proposed at the site. Energy Casino is aware that bonuses and promotions are an important part of the online gaming experience among the players. That is why the it has taken the liberty of availing some bonuses and promotions to keep their customers fully entertained. After making your first deposit into your account, a 100% match deposit bonus of up to €200 is yours to claim. After you claim this bonus, you can proceed to claim a 50% reload bonus upon your second deposit. With such sweet deals, it is quite evident that Energy Casino knows how to give new players a warm welcome. 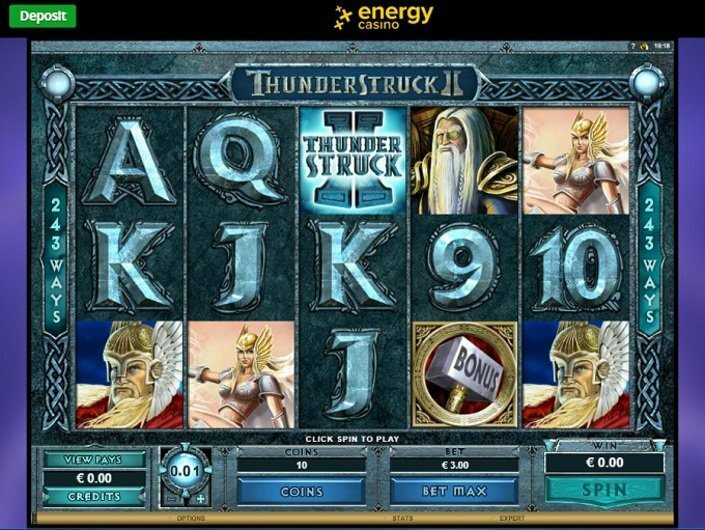 Select your favorite slot game to be part of an exciting weekly challenge here. The more points you earn, the greater your chances of landing a sweet spot on the leaderboard. Players with the highest points at the end of the week, walk away with sweet rewards. Play the game of the week, Tequila Fiesta and claim a 50% reload bonus of up to €50. 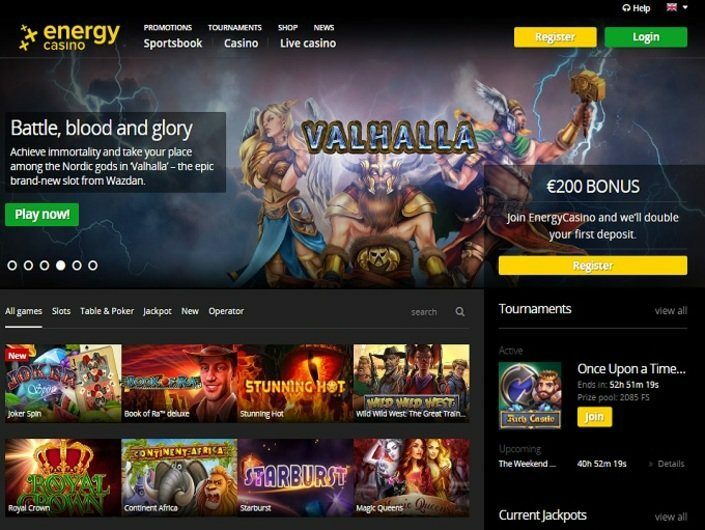 Energy Casino aims at delivering the best services to their customers and that is why they have collaborated with the best gaming software providers to provide the best games in the industry. 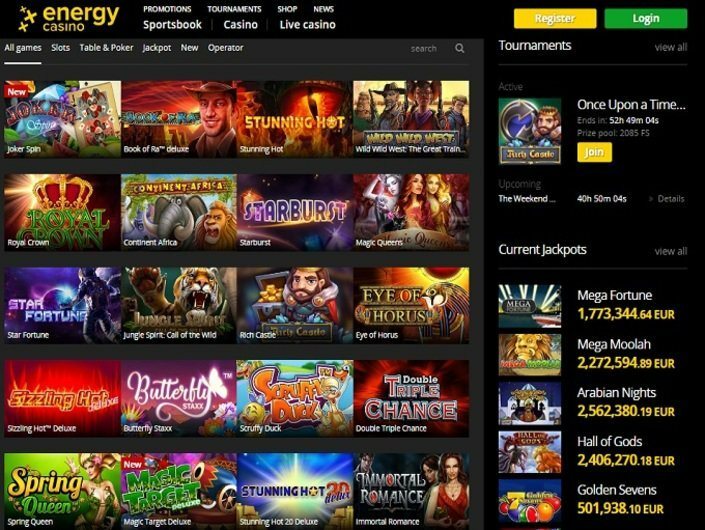 Before we talk about the games provided let us appreciate the efforts of NetEnt, Microgaming, GreenTube, Quickfire, Extreme Live Gaming and Wazdan, who are the software providers behind the smooth gaming sessions available at Energy Casino. For a chance to be part of a thrilling gaming experience, try out some of the most popular games offered here including slot games, live dealer games, table games and jackpots. Let us discuss these games in detail to understand why they are so popular with players. 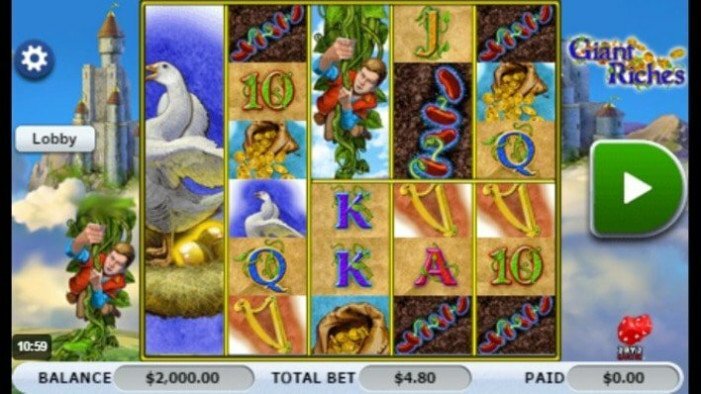 The game portfolio is abounded with slot games since most players find them appealing. 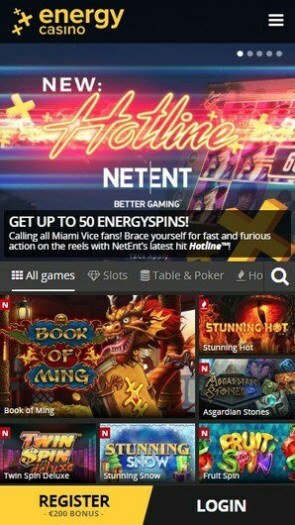 Whether you prefer classical slots or the new video slots, this casino has your back since it is in partnership with NetEnt and Quickfire that are notorious in producing quality slot games. Some of these games include Merlin’s Millions, Gonzo’s Quest, Jack and the beanstalk, Thunderstruck, Avalon II, Starburst, and Spinata Grande. To spice things up, there are some of the best progressive slots that we will discuss in the next category. With a wide variety of progressive slots, the players have a chance to walk away with a lot of cash thanks to the sweet jackpot. One of the most rewarding slots is Mega Moolah that is notorious for having the largest jackpots in the online gaming industry. Players that want to try out their gaming strategy and skills will love the vast collection of table games including Blackjack, Baccarat, Roulette and Poker. All these games have multiple variations to keep you entertained for hours. Energy Casino has up to twelve games available in the live dealer option, which is quite impressive for other casino offer less games in this platform. Some of these games include Live Roulette, Live Baccarat and Live Blackjack. Now that you are familiar with the great choice of games, try out any of them via the play money option or the real money option. 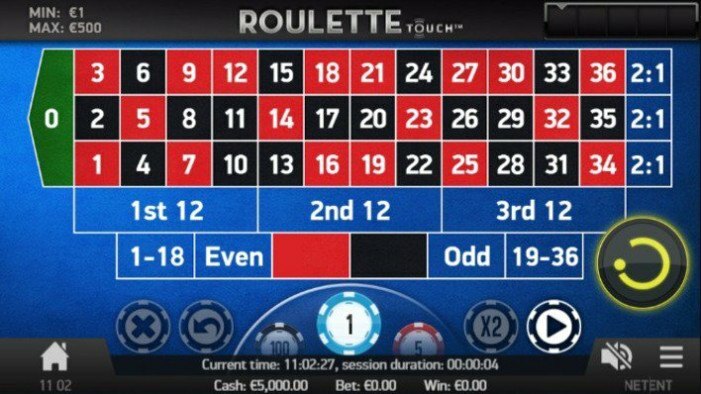 If you have never attempted any of these games, the play money option will be quite helpful for it provides a platform to enhance your gaming skills without betting real money. Once you perfect your skills, proceed to bet real money and stand a chance to win big. 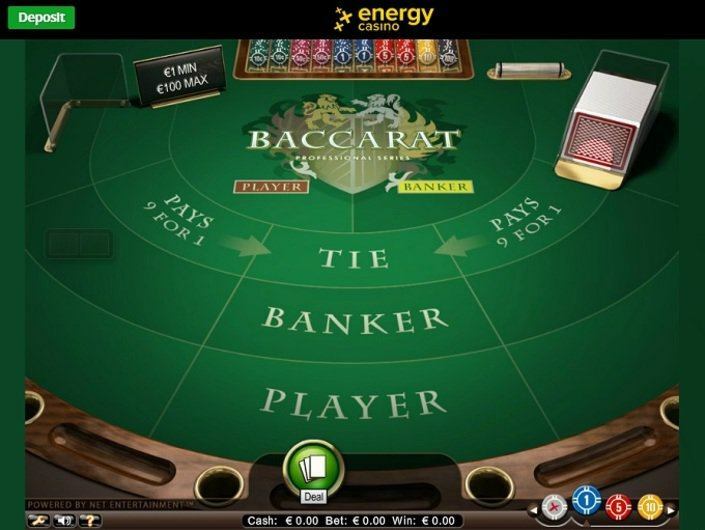 Currently, Energy Casino does not have a mobile application for their users. However, this does not mean that casino players cannot play on their mobile devices. Visit the Energy Casino website via your mobile default browser namely Google Chrome, IOS Safari and Mozilla Firefox and kick-start your gaming session through your device. Having played on both the PC and Mobile platforms, I can assure you that the gaming experience is similar and it is very difficult to tell the two platforms apart. This is because both platforms offer games with quality graphics, impeccable animations, and great sound effects that offer you a smooth and exciting gaming experience. 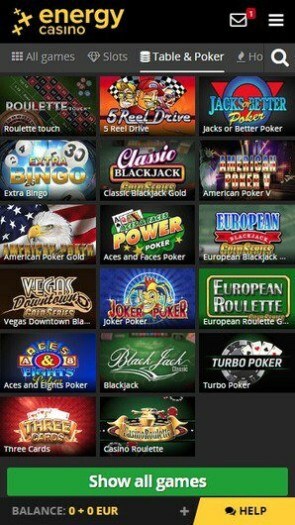 The mobile platform is not exclusive to playing games because you can make deposits and withdrawals to your Energy Casino account via the various banking options offered at the site using your mobile device. Energy Casino has put their best foot forward to accommodate their customer’s needs. One of the ways they have demonstrated this is by availing numerous banking options and accepting more than one currency to make payments. Some of the currencies accepted at the site include Euros, Canadian dollar, the USA dollar, British Pound and Australian dollars. Use your preferred currency in one of the following banking options to make money transactions here. You can use your debit cards or credit cards to make deposits and withdrawals at Energy Casino. All you have to do is credit your cards and upload it to your account. Some of the acceptable cards include MasterCard, Visa and Visa Debit. The fast advancements in technology have seen the introduction of online transaction methods like Skrill and Neteller that are commonly referred to as E-Wallets. Using E-Wallets is simple and straightforward because you only need to deposit funds into your E-Wallet then proceed to make money transactions to your Energy Casino account. Deposits via E-Wallets are instant while withdrawals take up to 24 hours. Therefore, it is not surprising that this is one of the most popular payment option among Energy Casino players. This banking option allows you to make payments to your Energy Casino account directly from your bank account. However, due to the many security checks put in place by banks, money transactions take one to three business days. Apart from that, this method is exclusive to countries that recognize online gambling activities, so if you do not reside in such a country, opt for another banking method. Now that you are familiar with the banking options available at Energy Casino, select one that is most appealing to you to make both deposits and withdrawals at Energy Casino. Support team is available 24/7 which means that you can contact them 24 hours a day, 7 days a week. Therefore, if you run into a query, you can always contact the Energy Casino agents via various communication channels including email, live chat option and telephone. Email – this communication channel is mostly used when you are required to send the customer support documents. Since the agents have to review the documents to come up with a comprehensive solution, it takes up to 24 hours for them to respond. Live Chat Option – through this channel, agents respond immediately because most queries handled here are easy to tackle. Telephone – players that prefer a personal approach opt for this method because they get to interact with the agents directly. FAQ Page – this page consists of comprehensive answers to the commonly asked questions at the site. Therefore, it is advisable to visit the FAQ page before contacting the agents for chances are that answers to your query are available in this section. ENERGY CASINO has its own personal style, and all games that are placed on the playground occur in a fast tempo mode. But this has its plus, as money can be earned quickly and without leaving home or even its work, as many do. The main thing is to have access to the Internet, and there everything will go by itself. I've been playing for more than two years, and I'm happy with the game, the interviewees and the chat. Also, during this time, a lot has been updated in the game, and has become more accessible and closer to ordinary players. This is the big plus. Just listen: ENERGY CASINO, one name of the game already speaks for itself. Therefore, I'm his big fan and I advise everyone who is just starting to play in this genre. Firstly, the input is made both from the computer and from mobile devices. Secondly, the input is instant, which does not make you nervous as in other casinos, because I do not like to wait. Thirdly, free slots, promotions, draws, bonus on deposit (and very sweet). And all this is invested in one of the British games. I am delighted. I advise everyone! In general, I do not really like the interface and menu of this casino, personally for me it is not the most convenient and the ergonomics of the site could still work. But this is not important when it comes to money and payments! I win almost every time I play in this casino. It is very important not to play all the time on the same slot and learn the tactics of other slots and change the game machine.